As of December 2018; 136 individuals have filed with the Federal Election Commission to run for President in the Democratic Party primary. I hope that’s a made-up number. This entry was posted in Election on December 31, 2018 by cleek. Across the state, Republican candidates for Congress won 50.3 percent of the vote and Democrats won 48.4 percent of the vote, according to a News & Observer analysis of vote totals. Democrats did not have a candidate in Eastern North Carolina’s 3rd district, won by Republican incumbent Rep. Walter Jones. Dems only ran in 12 of NC’s 13 Congressional districts. They still got 48.4% of the total votes. And they only won 3 seats. This entry was posted in Election on November 8, 2018 by cleek. This entry was posted in Election on November 6, 2018 by cleek. Raleigh- The districts for four N.C. House seats in Wake County will have to be redrawn again before the 2020 elections, a court ordered Friday morning in yet another loss in a gerrymandering case for the state legislators who drew the districts. The legislature has until July 2019 to redraw the districts, the panel of three judges ordered, four days before all members of the General Assembly stand for re-election. That means the new lines will be ready for the 2020 primaries and general election. This case is a ripple effect, seven years later, of the 2011 redistricting led by Republican lawmakers in the N.C. General Assembly. After the 2010 census, they redrew the lines for both the state legislature and North Carolina’s U.S. congressional seats. All of those 2011 maps have since been found unconstitutional, and replacement plans like the one in question now have also been found unconstitutional. In this case, the legislature was ordered to redraw districts for the North Carolina House of Representatives after a court found they had unconstitutionally been drawn to pack large numbers of black voters into a small number of districts, in order to diminish black voters’ political power. Don’t call them racist, though. This entry was posted in Election on November 2, 2018 by cleek. Latitude and longitude coordinates for 2018 early voting locations were obtained from the State Board of Elections and Ethics Enforcement’s lookup tool by using a Python script. Coordinates were not available for 2014 through this tool, so the bulk of these locations were generated using the U.S. Census geocoder tool. Addresses that could not be matched were manually researched and recorded using Google’s geocoder tool. In 30 North Carolina counties, there were no changes in early voting locations between 2014 and 2018, so these counties were omitted from the analysis. This left 580 sites for the two midterm elections. Voters in these counties were also omitted from this analysis, leaving 6,433,969 active and inactive voters, both of which are eligible to cast ballots, according to state elections officials. 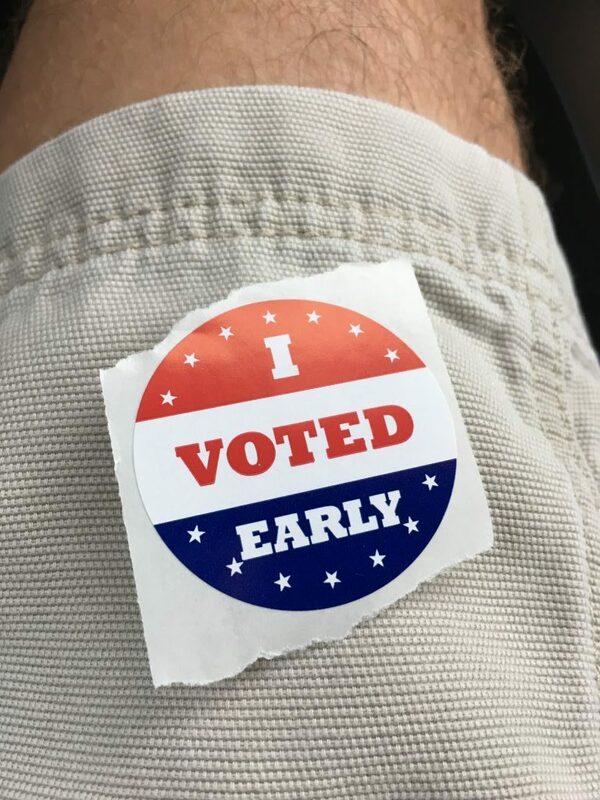 While some early voting locations may have been relocated due to the impact of hurricanes Florence or Michael, this analysis considered only the original early voting locations approved by local elections board and the state board. Latitude and longitude coordinates were then matched to active and inactive registered voters on addresses, city, county and ZIP using MySQL database software. The query failed to match the addresses of 145,645 voters, a 97.7 percent match rate. We used the free application programming interface (API) from the Open Route Service to generate isochrones – polygons for geographic information systems used to determine driving distances radiating outward from a point source. Isochrones were generated programatically using a Python script. Open Route Service limits queries through its API to 10 shapefiles at a time. The service also limits total API queries to 2,500 a day. Due to these limitations, the Python script runs queries for each site four times to produce a geojson feature collection with shapefiles at half-mile intervals from 0.5 to 20, with each polygon describing a driving distance range. For example, a point that appears in the isochrone with a mile value of 5, but not in an isochrone with a mile value of 4.5, is within 4.5 and 5 miles from the early voting location. Voter registration data, in CSV format, are loaded into the database, and a separate Python script was used to import the isochrone geojsons using ogr2ogr and its pygdaltools wrapper with a Python script. SQL queries can then generate mile values for each isochrone intersecting each voter, by county. By deduplicating the table based on the voter and keeping the smallest value, we can find the closest site and distance for each voter in 2014 and 2018. We then used database software to calculate the change in distance from the closest voting location in 2014 and the closest early voting location in 2018 for every active and inactive voter. Because the driving distances were limited to 20 miles from each voting location, 62,325 voters could not be matched with either a 2014 or 2018 isochrone because they were outside the 20-mile range. This amounts to less than 1 percent of the registered voters in the study for which the difference in driving distance could not be calculated. This entry was posted in Election, Programming on November 2, 2018 by cleek. What’s The Dumbest Thing A Libertarian Has Ever Said? Which brings us back to election day. Almost every politician with his or her name on the ballot—and certainly every politician with much of a chance of winning office at the state or national level—will use that power to engage in political acts via the state that clearly lack moral legitimacy. That’s because he or she will use government to enforce preferences instead of limiting the state to that narrow role there’s even a chance of justifying morally. What about voting defensively, like the old man hoping to keep his money? Except for those who genuinely embrace the radically limited government that has a prayer of passing moral muster, every politician represents a bundle of policies. Some are the political equivelant of “Let’s not take his money,” but most aren’t. Most are rights-violating and immoral. Even by voting defensively, you endorse innumerable wicked aggressions against your fellow men. If you cast a vote today, there’s a pretty high chance that in morally significant ways you’re acting just like those friends mugging the old man. You may think there are good reasons for doing this, that a world where you vote for violations of basic human dignity and autonomy will be more livable—happier, freer, wealthier, more equal—than one where you don’t. But you’re still party to countless immoralities. You’re still expressing approval as politicians fail to live up to basic moral standards—and as they do so in your name. This and other drooling idiocy can be found wherever libertarians gather.